Ten years on, students will benefit more from the ability to approach problems rather than the specific mathematics courses they studied at school. Addressing real-life problems which can be understood with common sense and a little mathematics, this book provides students with tools they can take beyond the classroom. Common Sense Mathematics is a text for a one semester college-level course in quantitative literacy. 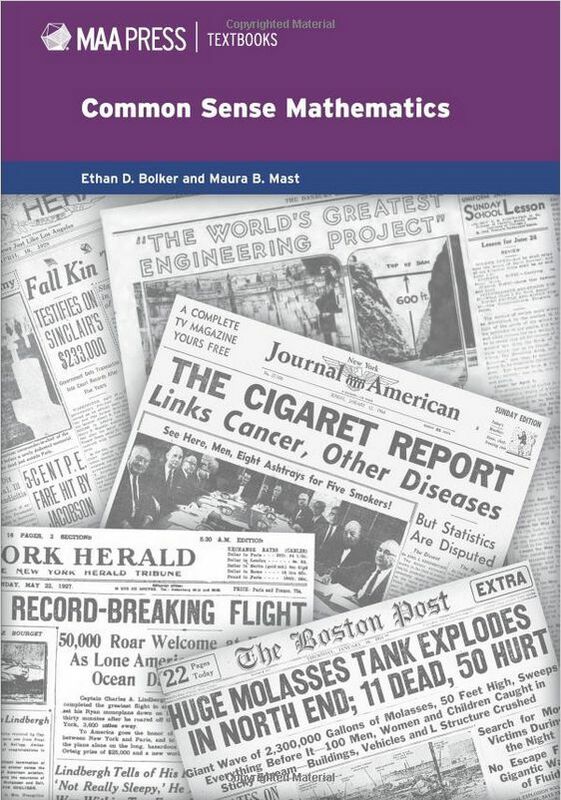 The text emphasizes common sense and common knowledge in approaching real problems through popular news items and finding useful mathematical tools and frames with which to address those questions. Ethan D. Bolker completed his PhD in mathematics at Harvard University, after which he became an instructor at Princeton University and an Assistant and Associate Professor at Bryn Mawr College, Pennsylvania. In 1972, he became a Full Professor of Mathematics at the University of Massachusetts, Boston. He retired in 2014. While at the University of Massachusetts, he chaired the joint Mathematics and Computer Science Departments for twelve years. He earned the Chancellor's Award for Scholarship in 1979 and for Teaching in 2003. Maura B. Mast became Dean of Fordham College, Rose Hill, in 2015. She is the first woman to be Dean of the College and the first Dean with a background in science and mathematics. Prior to moving to Fordham, she was Vice Provost for Undergraduate Studies and Associate Professor of Mathematics at the University of Massachusetts, Boston. Dr Mast has been recognised on several occasions for her teaching abilities. She has received the Chancellor's Award for Excellence in Undergraduate Teaching from the University of North Carolina, the College of Natural Sciences Dean's Award for Teaching Excellence from the University of Northern Iowa, and the Science Dean's Award for Outstanding Achievement in Teaching, Research and Service from the University of Massachusetts, Boston. She is still an active researcher in the field of differential geometry. We asked ourselves what we hoped our students would remember about this course in ten year’s time. From that ten year perspective thoughts about syllabus–“what topics should we cover? "–seemed much too narrow. What matters more is our wish to change the way our students' minds work–the way they approach a problem, or, more generally, the way they approach the world. Most people “skip the numbers" in newspapers, magazines, on the web and (more importantly) even in financial information. We hope that in ten years our students will follow the news, confident in their ability to make sense of the numbers they find there and in their daily lives. Most quantitative reasoning texts are arranged by mathematical topics to be mastered. Since the mathematics is only a part of what we hope students learn, we've chosen another strategy. We look at real life stories that can be best understood with careful reading and a little mathematics. We augment common sense and some mathematics with instruction on critical use of spreadsheets and the internet, providing students with more tools that that they will take beyond the classroom. Book website with instructors manual, spreadsheets, exercises, errata, etc.